DC Machine Dynamics – The DC machines are quite versatile and are capable of giving a variety of V-A and speed-torque characteristics by suitable combinations of various field windings. With solid-state controls their speeds and outputs can be controlled easily over a wide range for both dynamic and steady-state operation. By addition of the feedback circuit, the machine characteristics can be further modified. 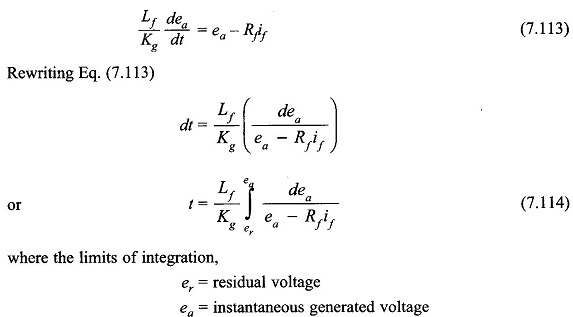 The aim of this section is to study dc machines with reference to their dynamic characteristics. The axis of armature mmf is fixed in space, along the q-axis. 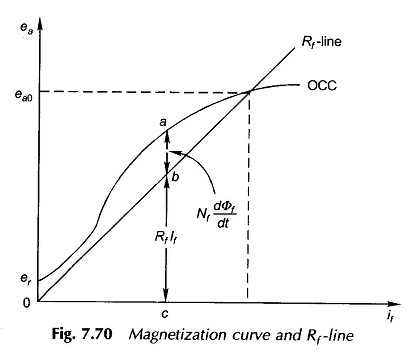 The demagnetizing effect of armature reaction is neglected. Mutual inductance (between field and armature) = 0; because the two are in space quadrature. Energy storage is associated with the magnetic fields produced by if and is and with the kinetic energy of the rotating parts. The above equations are a set of nonlinear* (because of products if(t)com and if(t)ia(t)) state equations with state variables if is and 04n. The solution has to be obtained numerically. From Eqs (7.106)—(7.108), the block diagram of the motor can be drawn as in Fig. 7.69. It is a second-order feedback system with an oscillatory response in general. It is reduced to simple first-order system, if La and therefore ra is neglected. 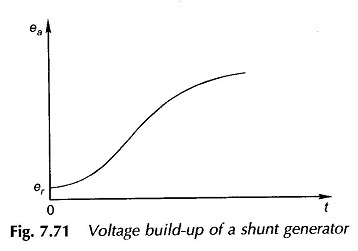 The qualitative explanation for the voltage build-up process in a shunt generator has already been advanced in Sec. 7.10. Here the mathematical treatment of this problem will be given, which in fact boils down to the solution of a nonlinear differential equation. This integral can be evaluated graphically by summing up the areas on a plot of 1/(ea – Rf if) against ea. This approach is employed to plot ea against time. The theoretical time needed for the generated emf to attain the no-load value, eao would be infinite; hence in practice the time needed to reach 0.95 eao is taken as the time needed to reach eao. The variation of ea with time is plotted in Fig. 7.71. The response is rather sluggish since only small voltage differences (= ea – Rfid contribute to the flux build-up (19.